Hector Sossi, the owner of the oldest Italian restaurant in Detroit, died Saturday. We met for the first time in February 2013. Detroit was covered by snow, but his genuine smile (and familiar accent) made me feel the warmth of home. The history of his Roma Café is a piece of Detroit's history. A fascinating and tasty one. I'm sharing an excerpt from the chapter I dedicated to him. Crossing the threshold of the Roma Café, Detroit’s oldest restaurant, is a bit like stepping onto the set of a period film. I can’t say which period exactly, but definitely the past. You find yourself in a place with soft lighting and no deafening background music, enveloped in the voices and laughter—also, miraculously, low in volume—of the people seated at the tables. The waiters, all in uniform, embody the Italian stereotype: moustache and dark olive complexions. That look, both polite and ironic, of people who know what they’re doing. In reality—the elderly owner, Hector Sossi, tells me—they are mostly of Arab origins. (I also met a man from Malta, while a bartenders has Irish and Italian origins.) From the outside, Roma Café is unmistakable. It’s a small building with a red-and-white-striped awning that stands out against the postcard image of a silent, industrial-looking landscape. Nearby there’s an enormous lot so empty that people walk through the middle of it. Next door, a valet parking lot that has encouraged the restaurant’s loyal clientele to venture out here for decades. Hector, a ninety-year-old who looks ten years younger, has by now left the reins of the restaurant to his daughter Janet. Nevertheless, nearly every day he arrives in his white Cadillac and appears in the restaurant around lunchtime. “I only buy Detroit cars, no Japanese cars because I fought in Okinawa during the Second World War. I was there when they dropped the atomic bomb. Truman’s decision saved the lives of thousands of Americans, mine included. They would have killed us all.” This bright-eyed gentleman was born in Ohio to immigrants from Biella (Masserano to be exact) who ran a restaurant in Cleveland. His father got sick from the fumes of the coal they used in the kitchen, and they returned to Italy when Hector was just six years old. “I lived in Mussolini’s Italy. Then in 1940 I decided to leave and I returned to the United States on the last transatlantic voyage of the SS Rex.” His destination was Detroit, to work in the restaurant owned by his uncle, Morris Sossi. “It wasn’t our place originally. It was opened at the end of the 1800s by another family, the Marazzas,” he says. They had a boarding house for the farmers who worked in the market next door, and they served such good dishes to their guests that they soon found themselves happily obliged to open a restaurant. Around 1920, the business passed into the Sossi family’s hands. “Up until twenty years ago I had about forty employees and served 200 covers a day,” Hector says, “now, 150 when business is good, but Fridays and Saturdays we have a full house.” What this place—unharmed by Detroit’s darkest years—has that’s special is authentic Italian American cuisine, affordable prices, old style service, and walls that, if they could talk, would tell stories that would enthrall entire audiences. Janet still remembers when, in December 1982, she received a phone call while the restaurant was closed. Frank Sinatra was on the line. After performing at the Fox Theatre, he wanted the restaurant to stay open to serve dinner to him and the two artists he was on tour with: Liza Minnelli and Sammy Davis Jr. “It was a magical night, they stayed until three a.m.,” Janet remembers. One of the customers that has remained in Hector’s heart the longest, however, grew up far from the spotlights of Hollywood but is famous in the industrial world: Vittorio Valletta, the president of Fiat for twenty years from 1946 to 1966. “He came to Detroit during the war, but he didn’t like staying in a hotel,” Hector remembers. “So my cousin offered to put him up. Since he always came to eat here with his engineers, we became friends and when I was visiting Turin he invited me to Mirafiori. I still remember his secretary’s name: Miss Gargioni.” Hector says that Valletta also gave him a Fiat 500 with a full tank of gas to use during his stay in Italy, and that car ran so well that an uncle of his then wanted to buy it. I looked into the Detroit Partnership a bit and discovered without much surprise that it was one of the most well-established and powerful mafia families in America. I use the past tense because I don’t have enough information to say what the family’s current status is. What is certain is that it’s still talked about. Just a few months ago, in July 2014, the American media reported the death of Giacomo “Black Jack” Tocco, the man suspected of being at the head of the criminal organization since the end of the 1970s. He lived in Grosse Pointe, a wealthy suburb east of the city where he was known as an active member of the community, generous in donating to volunteer groups and the Catholic Church. He died at eighty-seven, apparently from natural causes. The FBI agents who investigated him for decades describe him as a boss who’s far from gangster movie stereotypes: low-profile, very intelligent, an expert in business, able to keep himself out of bloody matters. And yet there’s the suspicion that he was involved in a homicide that’s remained a mystery: the murder of Jimmy Hoffa, founder and leader of the Teamsters union who disappeared from a parking lot in Bloomfield Hills (north of Detroit) in July 1975. His body has never been found, but his connections to the local mafia were well known. What grabbed my attention most, however, was another piece of news, this time read in the Italian newspapers. A few months before Tocco’s death, I happened upon an article in the Corriere del Mezzogiorno that reported the seizure by the authorities of a vast piece of land worth four million euros in the town of Carini, near Palermo. According to the investigation, the owner of the land, Salvatore Cataldo, had carried out a huge (and dirty) real estate deal through thick correspondence with the heirs of Peter “Bozzi” Vitale, another big shot in the Detroit Family. Vitale, I later learned, made history because he is considered one of the men who brought organized crime into the city’s sanitation industry. “No, we never had any problems. They knew my uncle and they left him alone. But now they’ve all disappeared. Their kids study business and have jobs. You don’t hear about the mafia in Detroit anymore.” Lucky them. “And then, we didn’t have only the Italian mafia here.” Hector’s right. One of the most famous criminal organizations in Detroit’s history, the Purple Gang, was made up mostly of Jews originally from Eastern Europe. They paved their way during the years of Prohibition, running the smuggling of alcohol from Canada and eliminating anyone who got in the way of their trafficking. In 1920, when the federal law prohibiting the consumption of alcohol was passed, they were already a force: it had already been a few years in Michigan by then that you couldn’t drink, thanks also to pressure from Henry Ford who wanted to keep his workforce sober. Roma Café is in the Eastern Market neighborhood, the oldest and biggest market district in the United States. In addition to being spoiled for choice with fruits and vegetables grown locally, you’ll find fragrant jams, pungent spices, and loaves of spelt bread that they always run out of too quickly. It might sound like I’m exaggerating it, but when I leave Detroit to return to New York I always have a jar or package from that market in my luggage, something that doesn’t even happen when I leave Italy. Not that the products are necessarily better, but among those stalls, there in the heart of Detroit, the air you breathe is genuine, it puts you in a good mood and brings a flush to your cheeks. Already open by the mid-1800s, in the course of a few decades Eastern Market became the state’s largest center for the sale of food products, wholesale as well 2. In 1891, it incorporated the other two markets in the city, establishing itself as a beating pulse in Detroit. It has also survived particularly difficult periods, and in the 1970s, in fact, was even decorated with the cheerful and colorful murals that still surround it today. In the last decade it has improved immensely. Since 2006, the city administration has turned it over to the Eastern Market Corporation, a partnership between public and private bodies that are handling its restoration and development. The enormous glass structure where more than 250 stalls are set up every weekend is surrounded by all kinds of shops: butchers selling wholesale, antiques dealers, candy shops, imported gourmet food, hardware and home goods stores. And then there’s a big variety of places to eat, something that’s not so common in Detroit: pizza, ice cream, seafood, noodles, Coney Island hot dogs, all concentrated in a few blocks. My absolute favorite is the Russell Street Deli, a long, narrow restaurant where there’s a single row of tables that seat six people each and you often find yourself sitting next to strangers 3. What I love about this place—aside from the hugely satisfying soups, sandwiches, and salads—is that even though it’s always crowded, you have the feeling you can eat without rushing. I really don’t know how to explain why, that’s just how it is. Today, a white Thursday in February, the Roma Cafè menu suggests something else. A cup of minestrone soup, a bit of spaghetti with butter and tomato, a piece of lasagna, and a bite of Veal Scaloppine a la Tosca because even though I generally avoid meat, I can’t turn down one of the specialties of the house. On the menu, it’s at the top of the list of “Italian Specialties,” but I would call it more of a transatlantic variation of the cutlet. It was invented by Morris Sossi when he took the place over and was inspired, Hector says, by Puccini’s opera and Piedmontese cuisine. The dish is a triumph of proteins: it consists of thin slices of veal breaded with a thick crust of flour and beaten eggs with parsley, garlic, and parmesan. After the drink with Hector, I find myself sitting at a table with Hillary Burnett, an artist originally from Detroit who is now based in New York. I met her through Brenda Cullerton, a woman and writer I’m very fond of. When Brenda introduced her to me, she told me she’d be able to accompany me on my discovery of a Detroit that’s difficult to see, the Detroit of the old upper-middle class born in the city’s golden years. Hillary did that, and a lot more besides. The table she picked wasn’t a casual choice. Hanging on the wall behind us there’s a caricature that portrays a group of the restaurant’s regular customers. Among them, all executives of local businesses, are Hillary’s father and uncle, the president and vice president of DIFCO Laboratories, a company that produces hospital supplies. “They would have lunch here every day,” she remembers. And there’s another picture in the room where we’re sitting that has something to do with her. It’s a portrait of Hector done by Joseph Maniscalco, a painter who was once well known in the well-off circles of Detroit. “He was my mom’s rival!” Hillary says, looking at the portrait with a smile somewhere between joking and contentious. Her mother, Patricia Burnett, was a portrait artist as well. I say “was” because now, at ninety-four, she’s put her paints and brushes away. I haven’t met her yet, but I know that she was a Miss Michigan, a founder of the Detroit feminist movement, and a dyed-in-the-wool Republican. A more explosive mix than Veal Scaloppine a la Tosca. “After lunch we’ll go visit her.” I can’t wait. Detour in Detroit at University of Turin! Teaching a class on Detroit during an Urbanism seminar, invited by architects and professors Federica Doglio and Anna Todros. The short documentary will be aired the next Spring during the show Scala Mercalli. In front of Columbia University's main building, interviewing Prof Robert Beuregard, expert in American post industrial cities. Now Erica Peplin and I share the same sky (New York), but her roots are in Detroit. Warriors come out and play. An encounter with Derrick May. Francesca Berardi’s book about Detroit will almost certainly inspire knee-jerk animosity: How dare a young Italian journalist drop by for a few extended visits and then publish a 250-page book about a city she barely knows? The offspring of this infatuation is “Detour In Detroit” (Humboldt Press), in which a writer who combines an open heart with a keen and educated eye offers insights even to those of us who have spent our lives trying to understand and appreciate this place, at a precipitous moment in Detroit history. How she pulled this off says something about both Detroiters (who are very welcoming) and Berardi (whose genuine interest in the world around her is palpable) . Those whose expertise she taps — an idiosyncratic selection of Detroit icons and everyday people — do not try to resist her. “She cold-called me,” recalls Greg Baise, curator of public programs at Mo-CAD, the Detroit contemporary art museum. At first put off by her interest in writing a guidebook, he was disarmed by Berardi, the journalist, almost immediately upon meeting her. “She was open- minded, wide-eyed and curious.” He takes her to Book-Beat, the independent book store in Oak Park, which now carries her book. No, it’s not in Detroit, which she acknowledges, but she’s flexible, even when we may not be. Grace Lee Boggs, the centenarian icon of Detroit progressive thinking, wanted to know if Berardi had heard of the 3D printer, even as they discussed 50 years of labor struggles and politics. 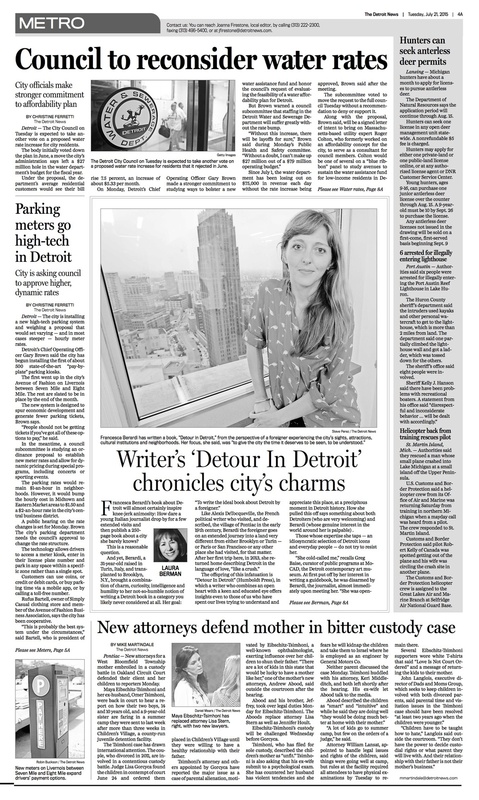 Detroit journalist John Gallagher talks about the book on the Sunday edition. I met him a few weeks ago in the Eastern Market, and we talked while having breakfast. On the table there were scrambled eggs, cups of coffee and two books: Detour in Detroit and Reimagining Detroit, a book he wrote in 2010 that I enjoyed. The book launch in Detroit with Mocad Curator Gregg Baise, surrounded by the breathtaking view of Chrysler House's top floor. Getting ready for the book launch in Detroit! This early morning we had our first coffee on air with the Great Voice of the Great Lakes, Paul W. Smith, at the 8th floor of the Fisher Building, one of the most fascinating place in Detroit. Stay tuned! Please, have a seat, Belle Isle is warming up! Yesterday I rode a bike around Belle Isle and for the first time I found more people that Canada geese. It was just lively. And beautiful. The last time I saw this fountain, it was silent and solemn, covered by snow. It was getting ready for long and loud show! Detour in Detroit is finally at home! Detour in Detroit in the hands of one of its protagonists, MOCAD curator Greg Baise. From the first time we met, Greg has been introducing me to wonderful people and places. Today, after a coffee at the Eastern Market, he took me to Salt and Cedar, a magical Letterpress studio. Its proprietor , Megan O'Connell, was there in front and shot this picture. She's so nice that I just wish I'd met her before! Grace Lee Boggs turned 100! ...featuring Antonio's pictures and our book! Thanks to Andrea Marinelli. Talking about Detroit in Berlin, with three special men: Dimitri Hegemann, Max Dax and Robert Defcon. I couldn't feel happier, with my pheasant's shirt, the book I made with Antonio Rovaldi in my hands, my brother and three wonderful friends in the audience. Thank you Humboldt Books for organizing the event and thank you Motto Books for hosting us. A conversation in my hometown with the publisher Giovanna Silva (Humboldt Books), the artist Antonio Rovaldi, the urbanist Chiara Lucchini (and Marilyn). And a lot of longtime friends in the audience!